Redbankgreen has been watching an attempted house flip in Red Bank for the past few months. An update is provided. "Remember that attempt to flip a house on Madison Avenue we told you about in June? I did a little bit of research on my own and noticed that a construction lien was filed with the county clerk for a total claim of $17,720.00 against this property. Also of interest, the contractor that filed the lien claimed he did $72,800.00 worth of work on the property. Therefore, the total out of pocket cost so far is about $547,800 assuming the total amount of the lien is paid off, and not including interest on the $360,000 mortgage (5.50% - 5 year ARM) and property taxes, insurance, etc. Last week the count was 4006. I predict listings will resume an upward trajectory about the third week of January. After all, the Spring selling season begins right after the Super Bowl if you ask a REALTOR®. "The Anderson Forecast team at UCLA might restore one’s hope that academic economists fulfill a productive function. Having disparaged the California housing boom through its ascent, a springtime presentation by one of its economists predicted the swoon that has come to pass. Alas, he stumbled. Asked if a real estate crash was in store, he reverted to form: Southern California is in no way comparable to such one-industry towns as Houston, and besides, California had never suffered a real estate meltdown. On the first point, with 2% of adults in California now proudly waving real estate licenses to sell, houses to California today may be as dominant a force as oil to Houston in the 1980s. On the second point, one of the worst real estate debacles in the history of the United States occurred on the ground where he stood." [Among all the defiant renters, few roar louder than Killelea, who pays $2,350 a month to rent a snug, two-bedroom craftsman house near Stanford University in Menlo Park, Calif. He figures it would cost him $7,000 a month in mortgage payments and taxes if he owned it. As a result of a number of infantile personal and denile of service attacks I am going to require that posters to the comment section register. Hopefully, once all of the idiots are scared away, I can resume anonymous posting again. Kara Homes Inc. is seeking a $40 million loan from Bear Stearns to help it build or finish building at least some of the 300 homes that were not constructed or left unfinished when the home builder filed for bankruptcy more than two months ago. The construction financing plan, spelled out in documents Kara filed with U.S. Bankruptcy Court, is in the initial stages. Kara first needs approval from Bankruptcy Court Judge Michael B. Kaplan to pay Bear Stearns $75,000 that it would use to study whether it should make the loan. It then would need permission to pay the New York investment firm another $100,000 to complete the transaction. "Experts have said the rate of home appreciation in the Valley was unsustainable. The average home price for 2005 was a record $207,000, up 12.5 percent from 2004, according to statistics from the Lehigh Valley Association of Realtors. It was the housing market's best year ever and the third consecutive year in which existing home prices in the Valley rose 10 percent or more. Homes were selling in a matter of weeks, rather than months. The market was bolstered by strong demand from home buyers moving to the Valley from more expensive towns in New York and New Jersey, and to a lesser extent the Philadelphia area. The newcomers found Valley home prices more affordable and often offered more than the asking price. Some paid cash for homes they bought here." "This small city near the Jersey shore recorded the lowest rate of violent crime of any town of 75,000 residents or more, according to Morgan Quitno Press, an independent research publisher in Lawrence, Kansas, which used FBI statistics in its analysis. " On November 29, the count was 4280. RedBankGreen has a write up about Hovnanian's earnings report. Needless to say, the results were pretty bad and the outlook for 2007 is worse than originally expected. Do any long time Shore residents remember a story from about the early 90s involving a Hovnanian owned yacht, a fire and a 20,000 feet mid-Atlantic abyss? I have a fuzzy memory of a very expensive boat being lost at sea many years ago after all hands were rescued; can anyone remember more about this incident? "Sellers employ incentives to avoid cutting prices"
"There was a time not so long ago when houses in Montclair would get five, 10, as many as 20 offers at prices $100,000, $200,000, even $400,000 above what the seller was asking. McMansions in Middlesex County and high-rises in Hoboken couldn't be built fast enough, fetch ing multiple offers before the shovel hit the ground. Houses sold not just before the "for sale" signs went up, but even before buyers walked through the door; offers were made based on the pictures buyers saw on the Internet." "Holiday blues: Kara Homes bankruptcy turns lives of prospective buyers upside down"
"Mark File is living a "borderline nightmare." Thinking he was only a week or so away from moving into a new home at Horizons at Birch Hill in Old Bridge, File sold his former house in June and moved his wife and two children into a hotel in Somerset. Months later, they were still living in a hotel room because their home still wasn't ready. And then on Oct. 5, builder Kara Homes Inc. filed for bankruptcy protection, the day before his home was scheduled for a final inspection. "It is still depressing going into the holidays," said File, 53, who is now renting a condominium in the same development where his new home stands, unoccupied. "Sometimes, you feel, like, that you got knocked off your feet somehow," File said. "You didn't see it coming. You don't feel like you deserved it. It is not a nice feeling for the holidays." File is among the 300 home buyers who had signed contracts and made deposits for homes that were in various stages of construction when Kara filed for bankruptcy. The company said it ran out of cash, blaming a slowdown in the real estate market." This NY Times article describes some of the reasons for the relative strength of the NJ Gold Coast (Jersey City, Hoboken, Edgewater, etc.) versus that of the suburbs. Executives from other major home building companies active in New Jersey like Tarragon Properties, K. Hovnanian Homes and the Pinnacle Companies also talked of urban projects as strong performers despite a general market malaise. Ms. Skarka is a vice president at Lennar Urban Northeast, a division of the national company that is a partner in developing Port Imperial, a $2.1 billion mixed-use project spanning nearly two miles on the Hudson waterfront in Weehawken, West New York and Guttenberg, all a short ferry ride from Manhattan. Lennar is also completing two projects in the Morristown town center and starting one in downtown Atlantic City. “The suburban market is still moving along” in New Jersey, Ms. Skarka said, despite the severely slowed sales pace and falling prices of the last six months. People are still buying single-family homes, she said, “but as a company, we’ve been focusing on our urban division for a while now because that’s where things are going really well,” and home values are holding up better, too. For example, in Edgewater, where Tarragon is opening One Hudson Park, a glass condo tower, sales have been slower than expected. Young professionals are signing contracts in the numbers expected, Mr. Friedman said, but not empty-nesters. I think the last paragraph says a lot about the state of the market. The natural buyer of an empty nester home in Chatham is the two bedroom seller in Hoboken or Jersey City. The owners of the two bedroom condo are trying to sell into a market with tons of new supply coming on line from Toll, Taragon, Hovnanian, Trump and they can't get the price they need to buy the Chatham home. "The growth of real-estate based debt is slowing and is causing lower consumer liquidity. The slowdown in household mortgage debt flow SHOULD lead to a recession - BUT the Federal Reserve is determined to prevent one. The latest economic statistics show that consumers depended on new debt for 90% of their cash flow during 2006. Any decline in debt flow will constrain liquidity and should cause a decline in the growth of consumption and household investment. We demonstrated in our March, 2006 update and confirmed in our June and September, 2006 updates that consumer liquidity was falling sharply. This report shows that consumers could be setting historic liquidity lows on all of our measures by January 1, 2007. " Dec. 14 (Bloomberg) -- Fitch Ratings said it will likely lower the credit ratings of more than 300 securities backed by the riskiest mortgages next year, as more funds are removed from reserves set aside to protect bondholders. The company will probably downgrade about 300 so-called sub- prime bonds this year, Grant Bailey, a director at New York-based Fitch, said on a conference call today. That number will increase in 2007 as older bonds suffer from too little funds in so-called over-collateralization accounts, he said. Does anyone know of any short sales occuring in the Shore area recently? I've looked at two houses in the Monmouth Beach / Long Branch area that were bought as flips in 2005 and I'm pretty sure the owners would be looking at a short sale if they did not get better than their asking prices. Also, do any particular brokers in Monmouth or Ocean Counties have expertise in negotiating short sales? This is a gragh of the ABX-HE-BBB 06-2 index. The ABX is an index of securitized mortgages and the triple "B" denotes its rating (triple "A" would be the highest.) Also, the "06" means it is comprised of mortgages written in 2006. 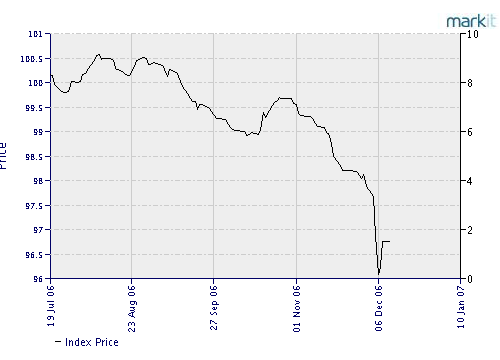 As one can see, the index started to weaken in early December and fell off of a cliff last week. The dive was reportedly due to the demise of sub-prime lender Own-It and broader concerns many sub-prime lenders are going to fail very soon. "The numbers do appear staggering: In September 2005 in New Jersey, there were 967 filings of lis pendens -- the first stage of foreclosure. This September, there were almost 1,650 filings -- a whopping 71 percent increase, according to the foreclosure data service Sheriffsalesonline.com. " This is the web site is for the Monmouth County Clerk. It allows you to search through various filings including foreclosure notices, deeds, mortgages, liens, etc. If you have a few minutes, peruse through the filings and you'll find some interesting information. Last Kara Thread is here. There were a number of rumors today about sub-prime lenders closing shop. This one turned out to be true. This forum on BrokerUniverse seems to be a good source for finding out which sub prime lenders are in trouble. "Dec. 7 (Bloomberg) -- Ownit Mortgage Solutions Inc., a California-based home lender part-owned by Merrill Lynch & Co., closed this week and told more than 800 workers not to return, a former employee said. The company informed its staff of the closure on Tuesday, Kevin Panet, who was a training manager for the Agoura Hills- based lender, said in a telephone interview today. Chief Executive Officer William Dallas didn't return messages left on his voicemail and with an assistant. Ownit joins Ameriquest Mortgage Co., Countrywide Financial Corp., H&R Block Inc.'s Option One, BNC Mortgage Inc. and other lenders in shutting operations or laying off employees as the U.S. housing market slows. Delinquencies are rising, home prices are falling and borrowers of adjustable-rate mortgages are facing higher monthly payments." The NY Times had an article yesterday that argued that home prices are actually down year-over-year, despite there being a prevelance of statistics that median home prices are mostly up year-over-year. "The truth is that the official numbers on house prices — the last refuge of soothing information about the real estate market on the coasts — are deeply misleading. Depending on which set you look at, you’ll see that prices have either continued to rise, albeit modestly, or have fallen slightly over the last year. But the statistics have a number of flaws, perhaps the biggest being that they are based only on homes that have actually sold. The numbers overlook all those homes that have been languishing on the market for months, getting only offers that their owners have not been willing to accept." Today's Wall Street Journal had a front page, top-of-column "A" article about the rise of delinquency rates of sub-prime mortages. Here is an excerpt. You need a WSJ subscription to read the whole article but it looks like the Grim's site has more info too. Americans who have stretched themselves financially to buy a home or refinance a mortgage have been falling behind on their loan payments at an unexpectedly rapid pace. The surge in mortgage delinquencies in the past few months is squeezing lenders and unsettling investors world-wide in the $10 trillion U.S. mortgage market. The pain is most apparent in subprime mortgages, though there are signs it is spreading to other parts of the mortgage market. Subprime mortgages are loans made to borrowers who are considered to be higher credit risks because of past payment problems, high debt relative to income or other factors. Lenders typically charge them higher interest rates -- as much as four percentage points more than more-credit-worthy borrowers pay -- one reason subprime mortgages are among the most profitable segments of the industry. I think we need to limit access to the beaches more by allowing beach clubs to erect barricades along right-of-ways and easements. Also, the Shore needs to generate more tourist revenue by raising the price on parking or just by issuing more tickets. Hoboken randomly boots cars, why can't Deal? More tax payer money to protect private beaches too. Those homes were not cheap to build and if private industry will not insure them, then my tax dollars should. Martells Luxury Condos sounds much better than Martells Tiki Bar. How about Donovan's Reef View Estates at Seabright? "JERSEY SHORE — Sixty municipal representatives, stakeholders and officials from 30 Monmouth County communities recently launched a two-year study that will culminate in a plan for the future development of the county’s Atlantic coastal region, spanning 27 miles of the New Jersey shoreline. Initiated by the Monmouth County Planning Board, the Coastal Monmouth Plan was launched at a meeting last week at Brookdale Community College, Lincroft. “The goal of the Coastal Monmouth Plan is to help those communities prepare, both collectively and individually, for sustainable growth while at the same time protecting their environmental resources and maintaining their unique local character,” said Monmouth County Freeholder Lillian G. Burry, who is liaison to the county’s Planning Board." I get lots of e-mails from listing agents describing various properties around Monmouth County, which I appreciate. What I have discovered is that (1.) I hate reading exclamation points and (2.) Realtors® use them by the ton. While exclamation points are annoying! (see) they are a pretty good indicator of when a Realtor® is posting in the comment section or on other message boards. "You must see this Gorgeous totally Remodeled & Updated Centerhall Colonial at the end of a cul-de-sac in the xxxx! This home has a great view of a Large Pond w Wild-life & Waterfowl around it. In addition to its many amenities, it has a Full Finished Bsmt w Ceramic Tile, Large Deck, New Siding, Roof, Windows, Appliances, Garage Doors, Driveway, Walkway, upgraded 200 amp electric plus too much more to list! This is a unique property in a fabulous neighborhood & is truly a must see!" The National Association of Realtors® spokesperson/economist David Lereah calls the latest drop in pending sales "stabilization". What else would he say, "housing prices have further to fall, run away at all costs and don't buy until 2011?" Pending home sales are hovering in a narrow range, another indication that a stabilization is occurring in the housing sector, according to the National Association of Realtors®. The Pending Home Sales Index,* based on contracts signed in October, slipped 1.7 percent to a reading of 107.2 and is 13.2 percent lower than October 2005. 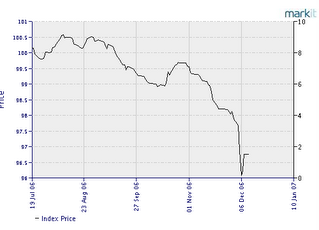 The index had trended up from a cyclical low of 105.6 in July, and a decline from year-ago levels is narrowing. In September, the index was 13.6 percent below a year earlier, while in August the decline was 14.0 percent." "Distressed Real-Estate: Priced to Sell"
"As a weak housing market nudges the foreclosure rate higher, next year is looking promising for investors in distressed real estate. So far, the U.S. housing slump hasn't produced a bonanza for such investors, but lenders stuck with foreclosed property are becoming more inclined to slash prices or sell properties through auctions, industry experts say. "We're all going to have to be more creative in the next 12 to 24 months" in selling foreclosed homes, says Chad Neel, president and chief operating officer of Fidelity National Asset Management Solutions, a unit of Fidelity National Information Services Inc., Jacksonville, Fla. Mr. Neel's company helps lenders manage and sell foreclosed homes. " "Dec. 1 (Bloomberg) -- The mortgage bond market is beginning to buckle under the weight of the worst U.S. housing slump in six years. Yields on so-called sub-prime mortgage securities rated BBB have risen to 6.52 percent on average from 6.28 percent on Sept. 5, data compiled by Bank of America Corp. show. The yield premium, or spread above the one-month London interbank offered rate, a lending benchmark, rose to a seven-month high of 1.2 percentage points." Have you ever gone to an open house even though you weren’t interested in buying the property? Have you ever pored over housing price data on Zillow or read through housing ads on Craigslist just for fun? You are not alone. There seems to be a growing obsession with real estate in the U.S., as home prices have soared in the past few years, only to come back to earth a bit in the past year.